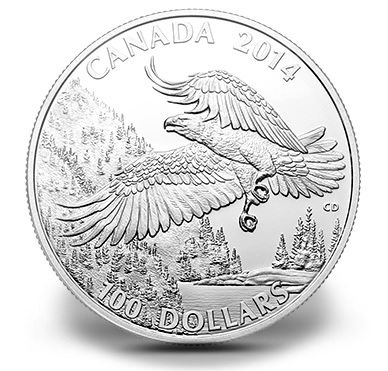 A third release in a fine silver coin series appears from the Royal Canadian Mint with the recent debut of the 2014 $100 Bald Eagle Silver Coin. This release is offered as the newest addition to the Mint’s popular Wildlife in Motion series which features one ounce, 99.99% pure silver coins sold at their legal tender face values of $100. Maximum mintage for the $100 Bald Eagle Silver Coin is limited to 50,000, which appears to make a sell-out likely. The previous two issues also had the same mintage with both selling out in short order. Those coins include the 2013 $100 Bison Silver Coin which made its debut in May 2013. It was followed by the 2014 $100 Grizzly Silver Coin which saw a release last September. The series is seen as a premium option to the Royal Canadian Mint’s $20 for $20 program which also has proven popular with collectors. 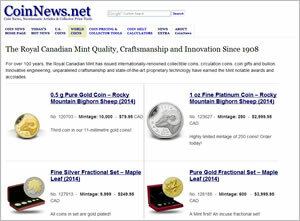 Of the coins offered in the more affordable program, all have also been declared complete sell-outs with the exception of the recently issued $20 Canada Goose Silver Coin. Shown on the reverse of the new $100 for $100 Bald Eagle Silver Coin is an action scene depicting a single bald eagle in flight. The design by Canadian artist Claudio D’Angelo shows the bird in a traditional Canadian scene complete with a lake, foliage and rising landscape. CANADA, 2014 and 100 DOLLARS is inscribed around the image. The obverse contains a portrait of Queen Elizabeth II by Susanna Blunt. Obverse inscriptions include ELIZABETH II and D G REGINA. Each is struck with a matte proof finish and a serrated edge. The diameter of the coin is 40 mm with a weight of 31.6 grams. An illustrated display box accompanies each purchase. A household order limit of three has been instituted. Orders may be placed directly with the Royal Canadian Mint at 1-800-267-1871 (Canada), 1-800-268-6468 (United States), or online at www.mint.ca. 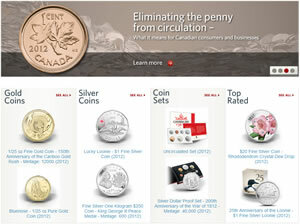 An affiliate link to the Mint’s $100 for $100 coins is located here . A subscription program is also offered. Those choosing the subscription option will immediately be shipped the Bald Eagle Coin now with the next coin in the series, the $100 Big Horn Sheep Silver Coin, shipped when released in July.